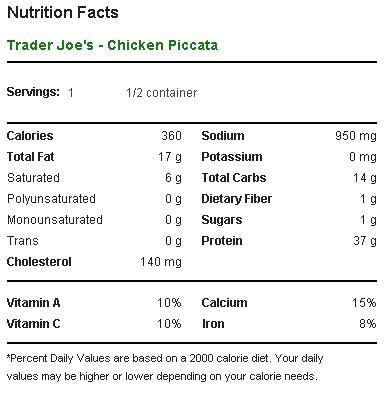 Trader Joe’s Chicken Piccata is an excellent, no-frills Italian-style chicken dish perfect for your last-minute dinner. 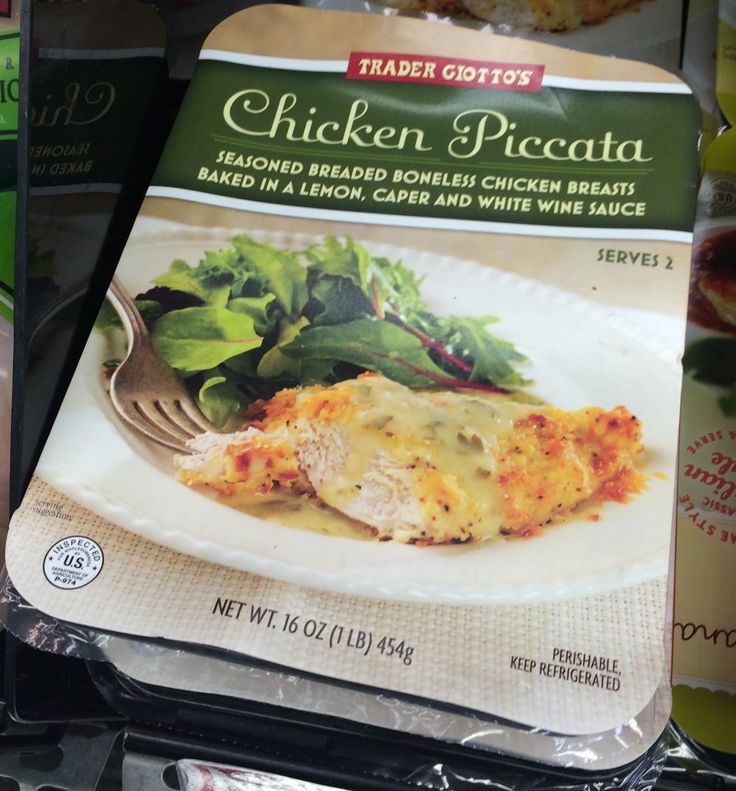 As TJ explains right on the box, chicken piccata is “seasoned breaded boneless chicken breasts, baked in a lemon, caper and white wine sauce. Even this simple descriptions belies the simplicity of the dish. When you open package, you’ll only find only two things within, breaded chicken cutlets, and a large pouch of yellowish sauce. That’s it – and that’s all you really need. This is a meal at its most spare. Simply open the sauce packet, apply to the chicken, throw it in the microwave for two and half minutes and your piccata is ready. This minimalist meal is pared down from the more bulked up version that Trader Joe’s offered back in 2013 that included a side of broccoli and pasta. That minimalism actually suits the chicken picatta well. Piccata, after all, has always been the very figure of quick and easy cuisine. Even traditional, hand-made chicken piccata (or veal piccata, if you going really old school) can be cooked up in a few minutes flat. The dish couldn’t be more streamlined if it had been designed in some sort of food wind tunnel (maybe it uses gravy instead of wind?). For example, the first step to a good piccata is smashing the hell out of piece of meat until it’s thin enough to see through. The chicken breast gets sandwiched between two sheets of wax paper and pounded remorselessly until the chicken is either a quarter inch flat or the cook has worked out all of his simmering rage. The flattened meat is then dredged through a mixture of flour and seasoning until properly breaded up. This has got to be the best part of the cooking process, because every resource I consulted on piccata uses the exact same terminology. “Dredge the chicken through the flour.” Dredge it. Dredge the chicken. up a more light-hearted sentence once it a while. Unless you decided to go with the veal, I suppose. “Dredge the veal” isn’t a sentence that’s likely to win many people over. At any rate, your smashed up, dredged meat is going to cook up on a hot frying pan almost instantly, at which point it’s removed from and the pan and the pan drippings are mixed up with some wine, lemon juice, etc into a sauce. And there you have it – piccata. Just that easy, bro. So while it’s understandable that there isn’t more to this piccata, it’s also a shame because what it has to offer is so good. The breaded chicken breast is pre-cooked, but retains its tenderness and moisture even after reheating. This is thanks, in some part, to the breading that encloses each breast in a thick, chewy layer that crisps up after cooking. 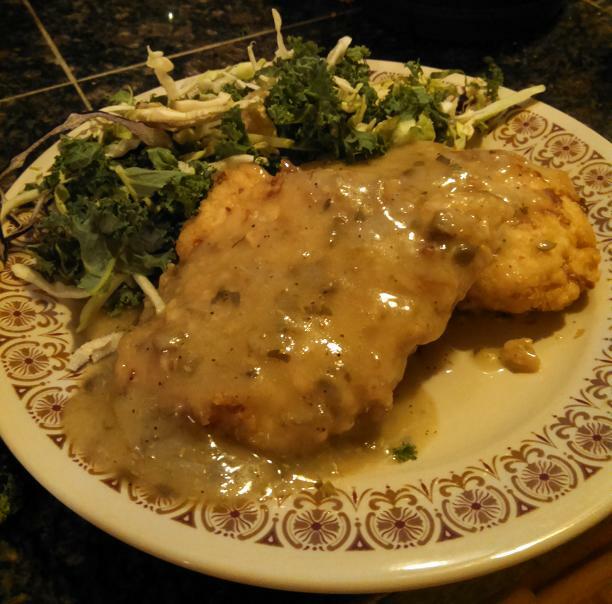 The breaded cutlet is pretty dang good by itself, but it’s the sauce that really makes this piccata a piccata. The lemon and white wine in the sauce are no mere threats – despite the heavy nature of the sauce (and its fat content) it tastes light and packs a zippy zing. It dangerously good, the strong, dry citrus taste pairing very well with the chicken, while the melted butter satisfies to the corners of the mouth. Would I Recommend It: Yes, this is as good as it is simple. Would I Buy It Again: I want to say yes – if only it wasn’t so fatty. Final Synopsis: A quick and easy Italian-American classic. Oh! I just tried this for the first time tonight. It was DELICIOUS. The sauce makes it pretty fantastic but the chicken was surprisingly moist and tender too. I opted to use the oven over the microwave (wasn’t sure how “rubbery” the chicken might turn out) and it was perfect. You get two decent sized breasts in the pack – they easily filled me up with a bit leftover. I would definitely buy this again. I microwaved it, and the chicken was PERFECT! Impressed. Are you kidding me?! Did we eat the same dish?! The chicken was wonderful, delicious, tender, tasty! The sauce was terrible, nothing like anything I’ve ever eaten that was called piccata. I tasted zero lemon, zero capers, zero salt…just a nasty, sour, mess…like old, vinegary wine that turned and started going bad, really bad. This isn’t just my opinion, all 4 of us agreed 100%. Please, eat the chicken! Toss the sauce! Can I order this through Amazon? we are wanting to know if we can buy this and freeze it so we can have it on hand when we are just too tired to shop or cook?. Would not buy again. The chicken was not pounded. It was way too thIck and rubbery. Just awful. Threw most of it away. Had this for dinner last night-added Jasmine rice and Kale salad. We loved the taste, the convenience and ease of preparation.